Durga says Guddan try to recall. Guddan says I am trying. Durga says I knew you can’t do this. Guddan says it is about saving AJ. I can do this. She says I was talking to that girl. Then two men came, they hit me and took her. They took name of a place. Let’s go there. Rawat comes to AJ and says you will never be out of here. Rawat gives his phone to him. He calls Guddan. Guddan says I will come to court. I wont let you get in any trouble alone. He says you don’t get in any trouble because of me. Don’t come to court. You dont’ deserve all this. She says so don’t you. I will come there with right proofs and witnesses. The hearing starts. Dadi hugs AJ in court room. Rawat’s lawyer and says I have this recording in which Antra said she was killed by AJ. He had always been violent. Guddan and the DILs are loooking for the girl at a desserted place. Laxmi says my feet hurt already. Guddan sees some thugs. She says how will I get in? If I call police they might hurt her. The lawyer plays Antra’s recording. AJ’s lawyer says this doesn’t prove anything. Who knows this recording is true. AJ is a very decent man. Rawat’s lawyer says so Antra would lie? And he kidnapped his wife’s sister to marry her. Ask Guddan. Where is she? Tell me if this is true or not? Guddan and DILs come to the thugs. They say we are the dancers. We entertain people to get some money. Please let us dance so we can have dinner today. The thugs ask them to dance. They dance. Guddan sneaks in to see where the girl is. Everything is going against AJ in the court. While other thugs are busy with DILs, Guddan looks for the girl. She hears her crying. Guddan sees her and comes to her. She says I will take you out of here don’t worry. They run but a thug stops them putting a gun on them. Precap-The case is going against AJ. Guddan is on her way. Judge says AJ has to be.. Guddan enters the court room. 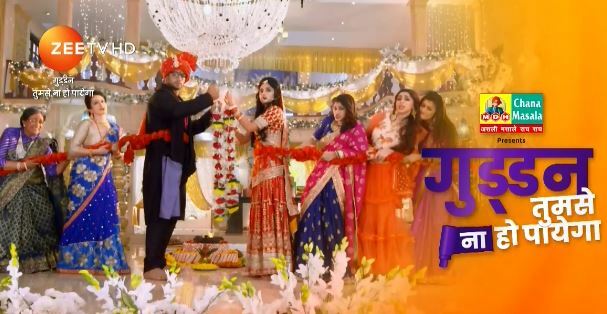 The post Guddan Tumse Na Ho Payega 4th March 2019 Written Episode Update: AJ’s hearing appeared first on Telly Updates.